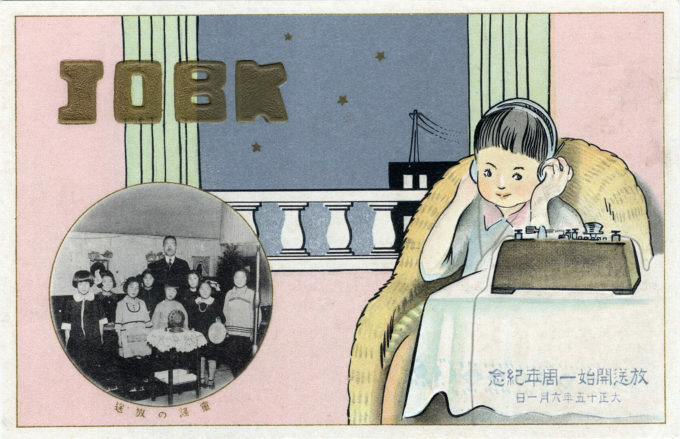 JOBK Radio, Osaka, commemorating the one-year anniversary in 1926 of the station’s first broadcast on June 1, 1925. “Radio broadcasting began in Japan in 1925 with the establishment of stations in the three major cities of Tokyo, Osaka and Nagoya. In August of the following year, the present Broadcasting Corporation of Japan was organized as a corporate juridical person with the above-mentioned stations as its nuclei and was placed under the supervision of the Ministry of Communications. “… Nowhere in the world are radio programs as rich in variety as in in Japan – in musical, dramatic and other forms of entertainment, as well as in programs of educational value … Perhaps one of the most interesting features of broadcasting in Japan is what is known as ‘radio calisthenics’. When the call is sounded from the Tokyo studios, millions of people in every corner of the land, old and young, rich and humble, almost instinctively rally around the speaker, at home, at school or at work, to join in the daily exercises designed to promote national health. For ten minutes and three times a day, these millions of health-conscious people exercise their bodies according to the instructions broadcast by the calisthenics director. 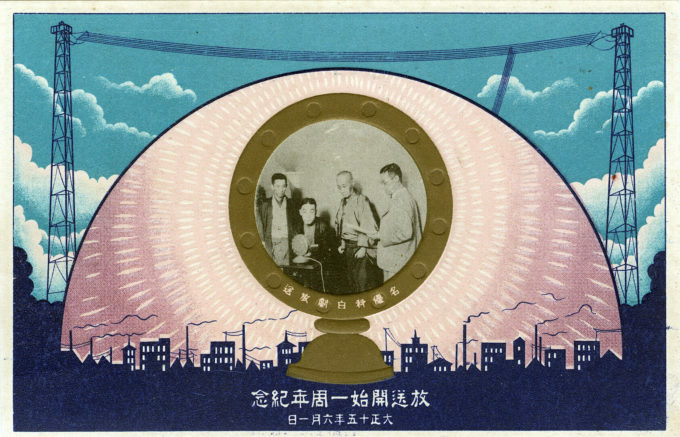 “From the wiki: Although radio sets were already in use overseas and radio broadcasts were due to begin in Japan in 1925, no radio sets were being manufactured in the country. Sensing that the age of radio was about to dawn, Tokuji Hayakawa [founder of Sharp Electronics] saw his own fortunes as inextricably linked to the future of radio. 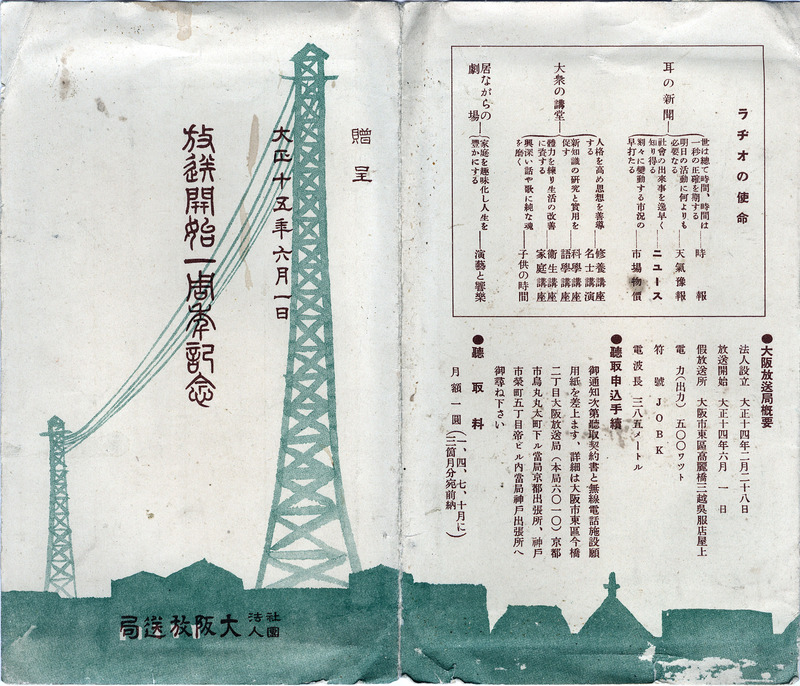 JOBK Radio (cover), Osaka, 1926.